What are these risks to the “fragile Peace Process”? What peace is being sacrificed “on the altar of Brexit”? Note the quasi-religious allusion to idolatry. 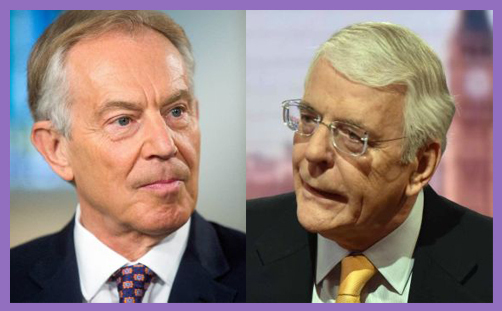 Blair and Major appear to be echoing the warning of Gerry Adams, who, speaking of the IRA in 1995, reminded us: “They haven’t gone away, you know”? The principles Jesus taught and which have so shaped us also include love for the poor, the alien and the stranger. The EU came together in a Europe broken beyond description by war, and has shaped a continent which until recently has contributed to more human flourishing, and more social care, than at any time in European history. ..On 6th June we passed the 72nd anniversary of D-Day, the great battle which was so significant in ending Nazi occupation of Western Europe. My father-in-law, Douglas Eaton, landed just after H Hour. He showed the family where he had fought, and we went to the cemetery where some of his unit were buried, a cemetery shared with German war dead. As he looked at the rows of graves of young men of both sides it was one of the very few moments when I saw him struggle for composure. There was no hatred, just sadness at such losses. He was pleased that Germans and British were buried together. His message was clear: Brexit imperils the peace of Europe; vote Leave, and we risk anthem after anthem for doomed youth. 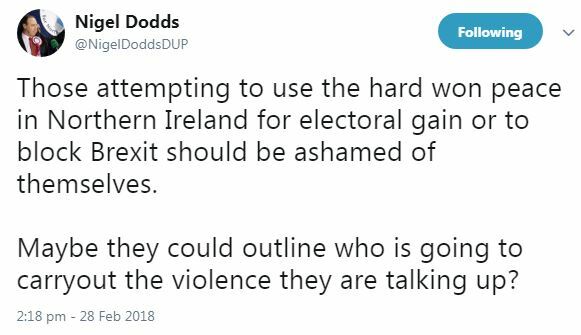 And this is essentially what Blair and Major are saying: that if there is a ‘hard border’ between Northern Ireland and the Republic, the IRA might bomb Theresa May and her Cabinet in their hotel during the next Conservative Party Conference; that they’ll resume blowing up children in Manchester, horses in Hyde Park, pensioners on Poppy Day, or kidnapping and kneecapping Unionist Brexiteers. Honestly, after 20 years of peace and prosperity in Northern Ireland, why should the IRA rekindle their armed struggle simply because the UK is leaving the EU Customs Union? It need not affect free movement of persons: the notion of a Common Travel Area between Northern Ireland and the Republic preceded UK accession to the EEC by 20 years. Of course, the European Union will seek rightly and properly to guard its own customs border, but the necessity and severity of that border is a matter for the Republic and the EU. It is constitutional illiteracy to insist that the Good Friday Agreement locks Northern Ireland into the EU in perpetuity. Peace settlements are provisional; post-conflict treaties may be (and often are) abrogated, sometimes unilaterally, as part of normalisation and sovereign aspiration. The Good Friday Agreement was a provisional treaty for securing peace, and that peace was won. It has been followed by 20 years (give or take) of democratic power-sharing and reconciliation. We are now as far from the Troubles as our forebears were from World War II when Harold Macmillan was making overtures to the Franco-German Axis to secure membership of the European Economic Community. If Belgium, France, Italy, Luxembourg and the Netherlands didn’t consider Germany to be a credible threat to continental peace just a decade after the War ended, surely Tony Blair and John Major can give Gerry Adams and his Sinn Féin armed wing a little conciliatory latitude two decades on from the final ceasefire? Or are we really to infer that Brexit may not be pursued because of the threat of resurgent IRA terrorism? In which case, we have reached the nadir of Project Fear, and hand the terrorists victory over democracy. It was an attempt not only to disrupt and terminate our Conference; It was an attempt to cripple Her Majesty’s democratically-elected Government. That is the scale of the outrage in which we have all shared, and the fact that we are gathered here now—shocked, but composed and determined—is a sign not only that this attack has failed, but that all attempts to destroy democracy by terrorism will fail. Blair and Major are invoking the spectre of resurgent IRA terrorism in an attempt to cripple Her Majesty’s democratically-elected Government. This may be outrageous and shocking, but it must fail, because Brexit is the democratic will of the people, and all attempts to destroy democracy by threats of terrorism must fail.